In my basement, lurks an old and well-kept secret. Folks who knew me 20 years ago knew that I collected something, something rather silly, and that it got a little out of hand. I had to stop. They know, I know, we don’t speak of it. More recent acquaintances don’t know about my one-time almost obsession. I had a problem, I faced it, I moved on. However, I still have the proof, the evidence, the menagerie, the collection. I can’t get rid of it. I kid myself they will be worth something some day, and you know what? I think they totally will. In my basement are over 170 Barbie dolls; they are in mint condition and most have never been out of the box. That’s right, I’m a recovering Barbie girl. I go through months forgetting about them. I don’t often think of my little blonde friends packed away safely. I’m not sure how I can walk pass 16 extra-large plastic bins stacked in my basement, right next to the washing machine, but I do. I blithely waltz by with a load of whites, not stopping to pay homage to the amazing, colorful beauties packed away in giant Tupperware. In my own defense, the crates tend to blend in. My collection started innocently enough. Back in 1992, I was writing a comedy sketch for Old Last Night for Big Top Chautauqua. It was a piece I wrote for Sally Kessler and Tom Mitchell, two well-respected actors. I thought it would be funny for adults to hold Barbie and Ken dolls, kind of like puppets and do a bit. It was funny enough – Ken was trying to pick up Barbie, and Barbie was bored, that is until another Barbie walked in. Then Barbie started admiring Barbie and they ended up leaving together…”Who else could Barbie love but Barbie?” The kicker? I needed dolls. It was a funny sketch, although I remember feeling it didn’t get the props it deserved. It was placed during a big break, so no one was really in the tent when it was performed. Also, this was before the wireless mic system, so no one could really hear the jokes but other than no one seeing or hearing it, I thought it was a huge success. As a joke, I kept the dolls on display in our very tiny, small, petite house. Because the house was so diminutive, the dolls kind of stuck out. Friends would comment on them, make jokes and put the dolls in compromising positions. I would kid I was going to start a collection and make it my nest egg for retirement. It was all in good fun. Yes, there is such a thing. The Troll Barbie had a little Troll doll toy with it in the box. However, the fun doesn’t stop there; the hair on the Troll doll was removable, it also worked in Barbie’s hair as a fashion accessory! 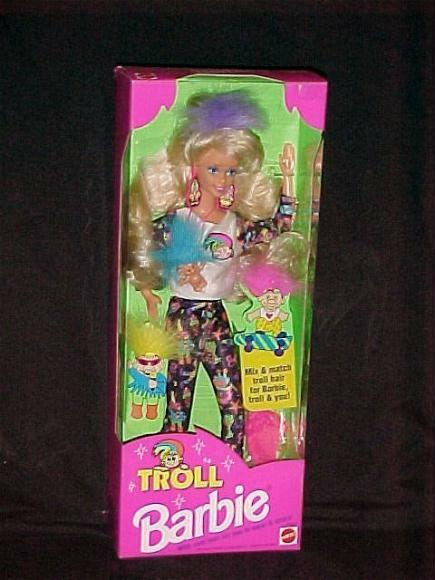 When Mr. Troll was wearing green or blue hair, Barbie could stash the hot pink little wig in her hair! (Oh, for cute!) You know why? Because it had Velcro on it. What gal wouldn’t want a piece of hot pink polyester and Velcro in her hair? I loved the kitsch of it; that was the beginning. After that, friends and family kept an eagle’s eye out for crazy, loony and unique Barbie dolls, and let me tell you, they were out there. Barbie for President, Astronaut Barbie, Rollerblading Barbie (sparks come out of her blades) and even a Harley Davidson Barbie. They loved getting me the crazy doll, and I loved getting them. After that, I went on an eight year binge. I would buy full collections at a time: Gone With the Wind, My Fair Lady, The Wizard of Oz, you get the idea. There are tons and tons of series. Like I said, Mattel knows what it’s doing. They put out collector series like a tramp, you know, puts out. 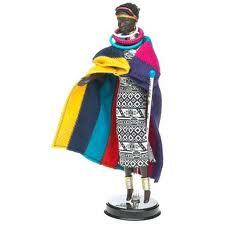 One of the biggest collections is the Dolls of the World series, because there are just so many countries! 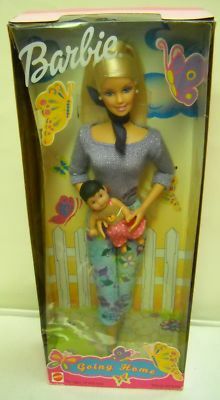 This is a perfect doll for the mom who struggles with her daughter playing with such a stereotype as Barbie, but she can swallow it a little easier if she can learn something about another culture. (Oh, alright!) All the better if the child is actually seen in public playing with a darker skinned Barbie. That makes the mother look multi-cultural and hip. 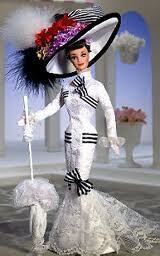 There are also the amazing TV series dolls. Those are particularly difficult for me to avoid, as I am a child who was raised on and by television. 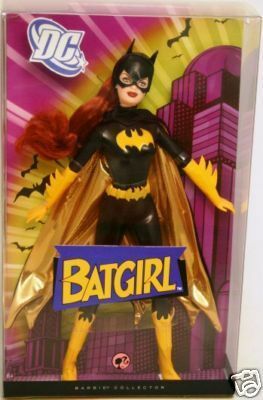 Star Trek, Bewitched, Batgirl, That Girl, I Love Lucy, and the list goes on and on and on. I own way, way, way too many of these types of dolls. My mother-in-law and her family are respectable doll collectors. Kriner’s aunt Libby has a room just for her dolls. They are all porcelain and fabulous. When they heard that I was collecting Barbie Dolls, it was like manna from heaven for them AND for me. No longer did they have to bother Kriner with “what size is she” and “does she have a Sears poncho?” After that they relished in picking out dolls for me. With their help, I am the proud owner of some pretty spectacular dolls. My problem reached a point where I realized I was spending more on dolls than say, groceries and bills. That wasn’t good. Stopping was simple, because frankly, we didn’t have the space to keep them. It has been over 15 years since I bought myself a doll, and over 10 since someone bought me one. 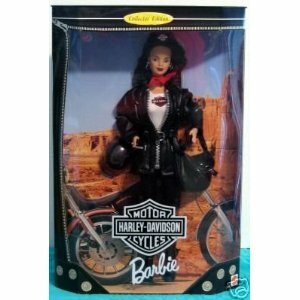 The last Barbie I got, and really treasured was when we adopted Em. Everyone who adopts a girl from China, stays in this one particular hotel, called The White Swan. That’s because, aside from Western amenities and an abundance of English speakers, it is across the street is the American Consulate, where some of the paperwork is done. When adoptive parents stay at the White Swan, they get a gift bag, filled with some baby things, some knickknacks and some other lucky baubles. But, in the bottom of the bag was a box with that tell-all pink top and those white letters in cursive. Sure enough, there is Barbie holding a little Chinese baby. I laughed and laughed. The box got a little smushed in the luggage on the way home, but I figure she may be worth someone on Ebay when Em is ready for college. Umm, I knew and I saw. I didn’t think it was an appropriate topic to discuss openly, but now the cat’s out of the bag! It is open season on Barbie. You know, I think you look a bit like Barbie! Well, if Barbie packed on an extra ten or fifteen pounds, and had some serious laugh lines, then yes. I do look like her! Was that Mary Ganchoff who gave you the troll Barbie? HILARIOUS!